When you’re in need of air compressor repair services in Athens, Tennessee, you want a company that can deliver a prompt response time. After all, emergencies can happen at any time and often at times that are the most inconvenient. Whether you experience a breakdown over the weekend, on a holiday, or at 3:00 in the morning, you can count on A&W Compressor to take care of all of your compressed air system needs. Our technicians are on call 24/7/365 to ensure your system is back up and running as soon as possible. We offer an unparalleled level of experience, and our employees are all factory trained. 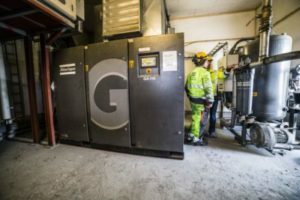 We work with all makes and models of air compressors, including Atlas Copco. No equipment is too large or too small for us to handle. As a service-oriented business, our customers are our top priority, and we work hard to ensure complete satisfaction in all of the products and services we offer. In addition to our equipment repair services, we also offer preventative maintenance services to keep your business running smoothly. What’s more, countless businesses rely on us to perform air audits that can identify areas where equipment can be improved for enhanced efficiency. In fact, we can even quantify annual cost savings that these efficiencies would provide. And, if it’s time to replace your equipment, you need a specific part, or you need a compressor on a temporary basis, our new and used sales and rentals have you covered. If you’d like to learn more about the air compressor repair, audit, maintenance, or other services we offer in Athens, TN, contact A&W Compressor today.